Born at 24 weeks, Vikram faced many challenges during his stay in the Neonatal Intensive Care Unit. 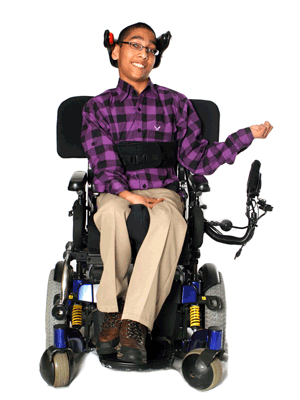 At 8 months old, he was diagnosed with Cerebral Palsy but later his family would learn Vikram would be a quadriplegic. Fortunately, Thames Valley Children’s Centre was there for the whole family. Vikram uses a communication device to interact with his friends, family and community. He also uses a customized power wheelchair to get around. Vikram truly embraces technology to ensure he has the independence he needs! TVCC has been there every step of the way helping Vikram and his family. Thanks to the support of his therapists at TVCC, nothing can stop this motivated young man from reaching his goals!